I was watching this programme in order to prepare for the Cyberpunk table I'm helping create for Little Wars Melbourne 2018, my contribution being a "Public Security Section 9" team and a few terrain pieces. As I've been trying to keep my "Superhero Media" articles more or less in "order", I was tempted to hold off on Stand Alone Complex until after I reviewed the original Ghost in the Shell, but then should I do the manga first? It's a bit of a rabbit-hole, because of the differing continuities and all that, so I just kind of went for it. In 21st century Japan, the majority of the population have augmented bodies with "cyberbrains" that facilitate a world connected 24/7 with everyone and everything. In order to protect from the bold new frontier of "cyber-terror", Public Security Section 9, a collection of hackers, detectives and former combat cyborgs, operate in the shadows, with minimal government oversight. When a case evoking a kidnapping six years previous hits the news, Section 9 may be the only team equipped to finally answer the question of the "Laughing Man". The series is divided up between "Stand Alone" episodes, with no connection to the main plot, and "Complex" episodes, which follow the Laughing Man investigation; so if you want to see the story but not necessarily all of the 'filler", you can with a little help from a wiki. My DVDs also feature the "Tachikoma Days" shorts after each episode, which are fun, but can kind of ruin the flow if you're binging, like I did this time. Sorry that this "Superhero Media" is more focused on technical aspects than narrative, but to give too much away kind of ruins the programme. The Laughing Man investigation leads Section 9 to a potential government cover-up and corrupt drug companies, which makes for some clever episodes punctuated with combat-grade cyborgs beating each other down to keep the pace up. 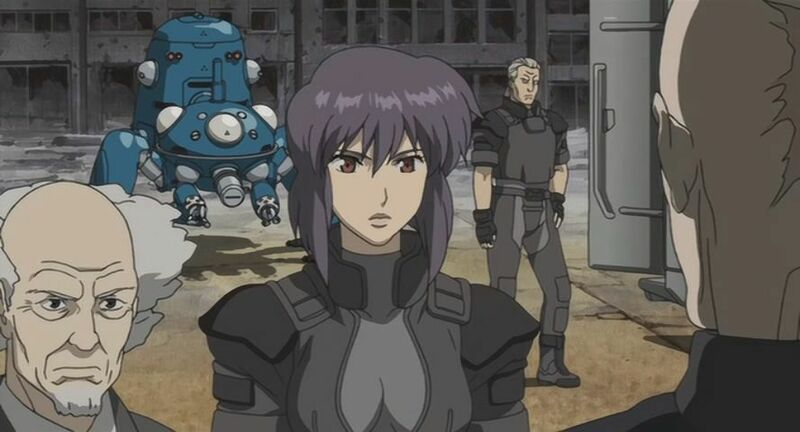 Many of the "Stand Alone" episodes are really entertaining and build the world nicely, expanding on the "last world war" in which Mokoto, Bateu and many of the other cyborgs fought and giving glimpses of what China, England and the USA are like in the Ghost in the Shell world. 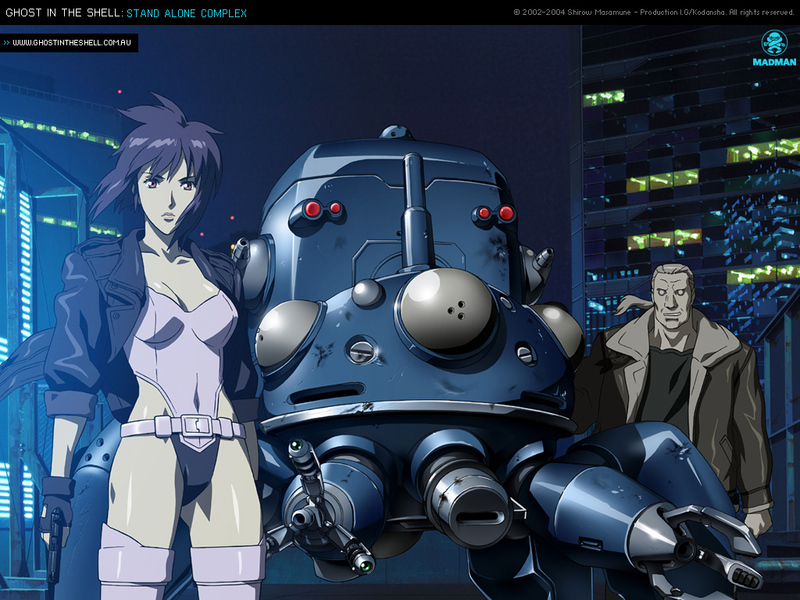 It hasn't come across in this article, sorry, but Stand Alone Complex is a really clever programme in the way Anime fans insist that all anime is (even when it isn't). To define the term "Stand alone complex"; 'Accidental collectivism made up of detached individuals, resembling a highly organized conspiracy and lacking a deliberate origin.' Or, as the programme uses "copies produced without the presence of an original". Both definitions work as a metaphor for the narrative and the programme itself, with the story and series being created with the blessing-yet-absence of Shiro Masume, the author of the original. There are no simple solutions in Stand Alone Complex, no "A-B-C" progression, it is dense and deals with some deeper themes, perfect if you've been watching a lot of crappy superhero films, like I have, but maybe not great if you want to see cyborgs beating the crap out of each other all of the time. Like, have a grounding in existential philosophy if you want to get the most out of this programme. And no, you don't need to see the film first, but the film is still "better".